The programmed information is grouped together on the instrument panel display. Pressing the accelerator pedal to exceed the programmed speed will not have any effect unless you press the pedal fi rmly past the point of resistance . Returning to the programmed speed, by means of intentional or unintentional deceleration of the vehicle, automatically cancels the fl ashing of the programmed speed. Turn thumb wheel 1 to the "0" position: the speed limiter mode is deselected. The display returns to the distance recorder. 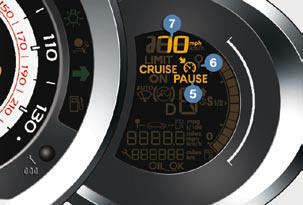 Switch off the cruise control by pressing button 4 : the display confi rms that it has been switched off (PAUSE). Intentional or unintentional exceeding of the programmed speed results in fl ashing of this speed on the display. Return to the programmed speed, by means of intentional or unintentional deceleration of the vehicle, automatically cancels the fl ashing of the speed. 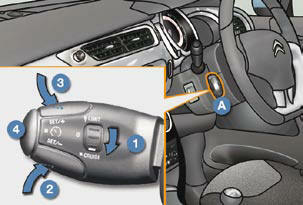 Turn thumb wheel 1 to the "0" position: the cruise control mode is deselected. The display returns to the distance recorder.